Antelope is a term for many even-toed ungulate species. This is not a strict taxonomic term; they are not a clade. 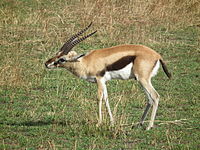 Antelope is a 'wastebasket taxon' within the family Bovidae. It includes the old-world species which are not cattle, sheep, buffalo, bison, or goats.